Next week from the 15 April Extinction Rebellion activists hope to close down Central London to prompt a radical change of direction in our national conversation: away from Brexit and towards a much more pressing issue—ecological breakdown. Extinction Rebellion (XR) was formed in early 2018 by a group of people determined to reverse societal and political inaction on climate change. Despite decades of environmental campaigning, fundraising, lobbying and protesting, global carbon emissions and subsequently global temperatures are continuing to rise. For those concerned about the future of our planet, traditional methods of protest have failed. A new approach is needed. At the current trajectory, the planet is due to pass the 1.5ºC mark in 2030. We have just 11 years to avert ecological and social disaster. Despite climate warnings, the UK government has failed to act. In an action that many climate campaigners have described as “unforgivable”, in June 2018 MPs voted overwhelmingly to expand Heathrow Airport, committing the UK economy to a high-carbon future. Extinction Rebellion demands the government completely decarbonises the economy by 2025, proposing citizens’ assemblies as a democratic means to make the difficult decisions that elected politicians shy away from. In order to bring the government to the negotiating table, Extinction Rebellion draws inspiration from Leo Tolstoy, Mohandas Gandhi and Martin Luther King in promoting a strategy of mass-participation nonviolent civil disobedience. Extinction Rebellion researchers estimate that if 3.5% of the British population are inspired to join the rebellion, the government’s ability to maintain control will be breached and they will be forced to negotiate. To this end, Extinction Rebellion are encouraging everyone to come into central London from 11am on Monday 15 April and to stay in control of five strategic locations: Marble Arch, Oxford Circus, Piccadilly Circus, Waterloo Bridge and Parliament Square, day and night for as long as it takes to force the government to negotiate. For Extinction Rebellion activists, nonviolence is both a moral position and an evidence-based strategy that is proven to be effective in forcing governments to change. According to research on conflicts between non-state and state actors around the world between 1900 and 2006, it was found that 53% of nonviolent campaigns were successful as opposed to 26% of campaigns that used violence. Moreover, of the violent campaigns, 95% had descended into dictatorship or totalitarian rule within five years. Civil disobedience means peacefully breaking the law and being prepared to get arrested and go to prison. Extinction Rebellion estimates that so far, upwards of 1,000 people have prepared themselves for this. The majority of people taking part in the action will not be putting themselves in arrestable situations and many have been trained in supportive roles such as legal observation, first aid and arrestee support. As a paediatrician and the father of a young child, I will be joining the rebellion in this supportive capacity. Rebels hope to provide a nonviolent and welcoming environment for families, children, disabled people and minorities. A “creative, festival atmosphere” is planned, with activists planting trees and bringing pot plants to turn Waterloo Bridge into a “garden bridge”. Plans are also afoot for musical events, organised children’s activities, political talks, workshops and performance art. With hundreds of activists already pledged to peacefully disobey the law in central London and an exasperated public becoming more sympathetic toward the need to take radical action, we hope that Extinction Rebellion will become the movement that changes everything. The public health risks of Brexit pale into insignificance when compared with the threat of inaction on climate change. As opinion leaders in society, doctors must play a key role in supporting the necessary transformation in our society. 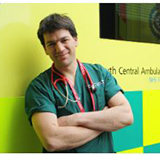 Alex Armitage, ST6 Paediatric Emergency Medicine, Queen Alexandra Hospital, Portsmouth. 1.IPCC, 2018: Global warming of 1.5°C. An IPCC Special Report on the impacts of global warming of 1.5°C above pre-industrial levels and related global greenhouse gas emission pathways, in the context of strengthening the global response to the threat of climate change, sustainable development, and efforts to eradicate poverty [V. Masson-Delmotte, P. Zhai, H. O. Pörtner, D. Roberts, J. Skea, P.R. Shukla, A. Pirani, W. Moufouma-Okia, C. Péan, R. Pidcock, S. Connors, J. B. R. Matthews, Y. Chen, X. Zhou, M. I. Gomis, E. Lonnoy, T. Maycock, M. Tignor, T. Waterfield (eds.)]. In Press. 2. Chenoweth, E., & Stephan, M. J. (2011). Why civil resistance works: The strategic logic of nonviolent conflict. New York: Columbia University Press.